WorkflowDeploymentService - This class manages workflow definitions and workflow activity authoring. 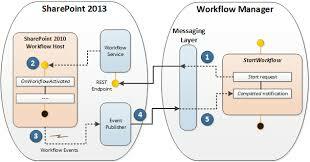 WorkflowDefinition - Represents a SharePoint workflow definition and includes the workflow properties. WorkflowDefinitionCollection - Client object collection of WorkflowDefinition class. WorkflowSubscription - Class responsible for having subscriptions to the external workflow hosts such as Azure workflows. // We can loop through the definitions.